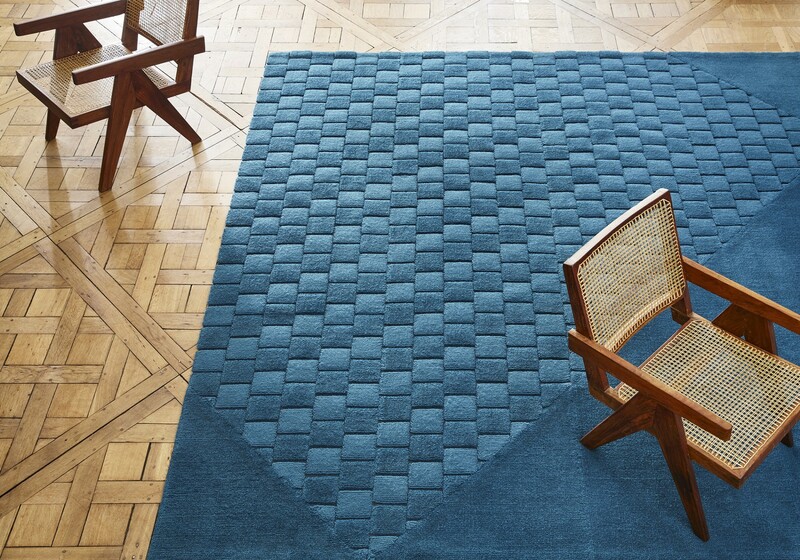 A Cogolin rug is a unique piece crafted by artisans with exceptional expertise. 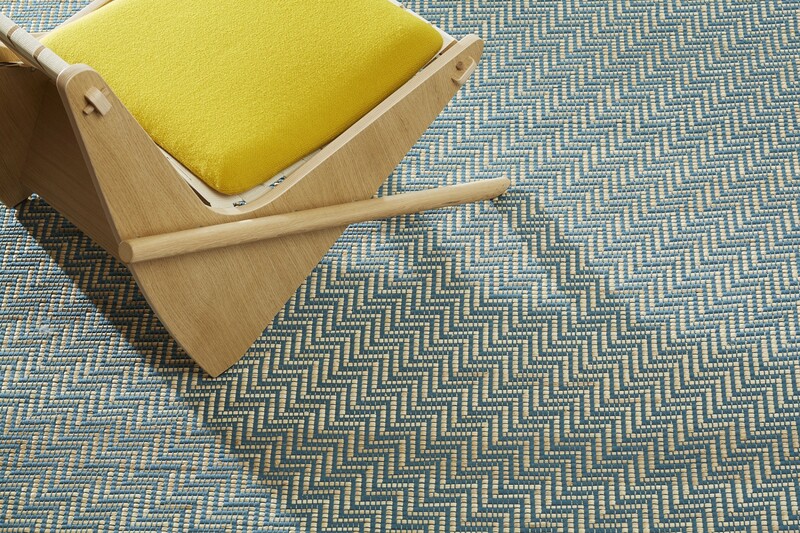 Displaying original textures and designs, rugs are hand-woven in panels 70 centimeters wide, while “flat weave” versions, which come in raffia, cotton, linen and wool, are woven in panels ranging from 50 centimeters to 3 meters wide. 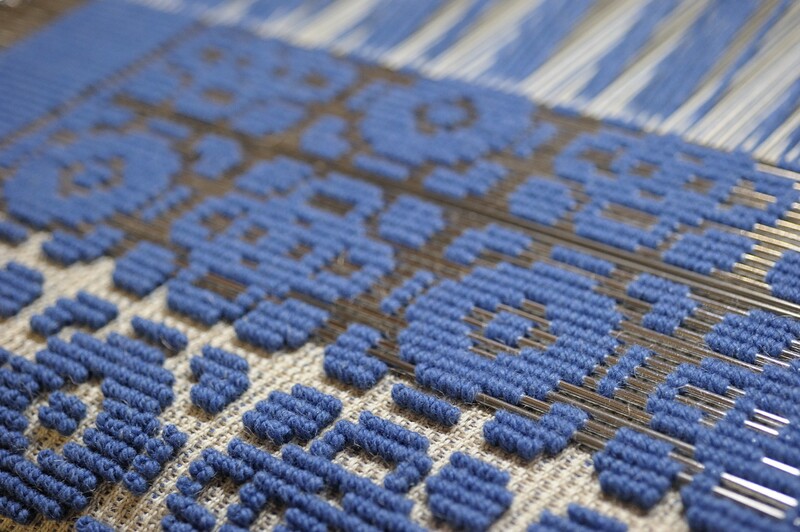 The panels are woven independently and sewn together by hand to create rare and timeless rugs. The best-kept secret among today’s most sophisticated clients in search of exceptional craftsmanship and tradition, La Manufacture Cogolin was founded by Jean Lauer. 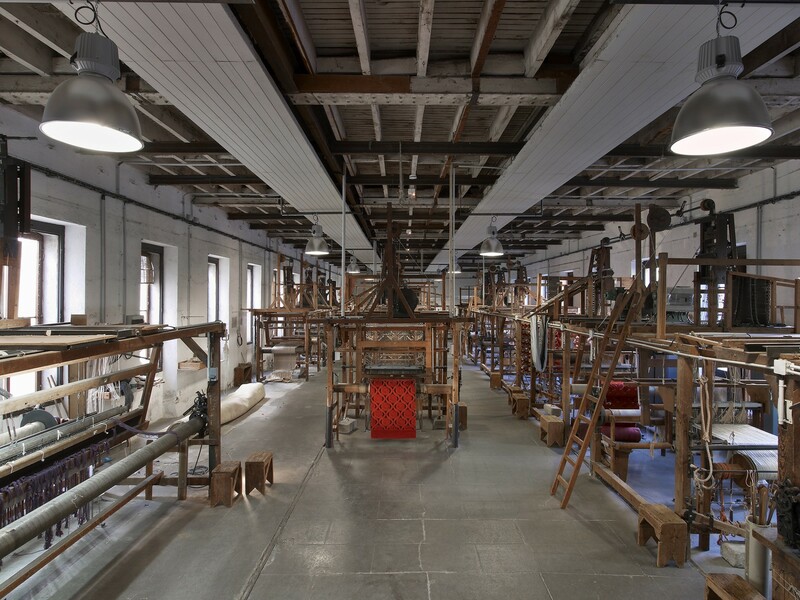 In 1928, he moved the looms from his Aubusson workshops to La Manufacture and the rest was history. The heir of an enduring cultural legacy, La Manufacture Cogolin and its talented artisans draw on the heritage of the past and innovations of the present, designing exclusive rugs to decorate the world’s most prestigious luxury hotels, embassies and private residences. With its instantly recognisable elegance and original geometric patterns, La Manufacture breathes new life into its authentic antique looms to create a very unique style with a subtle Mediterranean touch. The Cogolin handlooms have a Jacquard mechanism (these revolutionary Métiers, created in 1801, take their name from their inventor). The Jacquard mechanism combines needle, cylinder and punch-card techniques. These techniques function like sheet music, guiding hooks that raise threads according to punch-card holes to create textured designs and elaborate patterns. The Cogolin palette is made up of 200 colours, based on 32 luminous shades. Developed exclusively for La Manufacture, the dyes are produced according to the highest environmental standards. 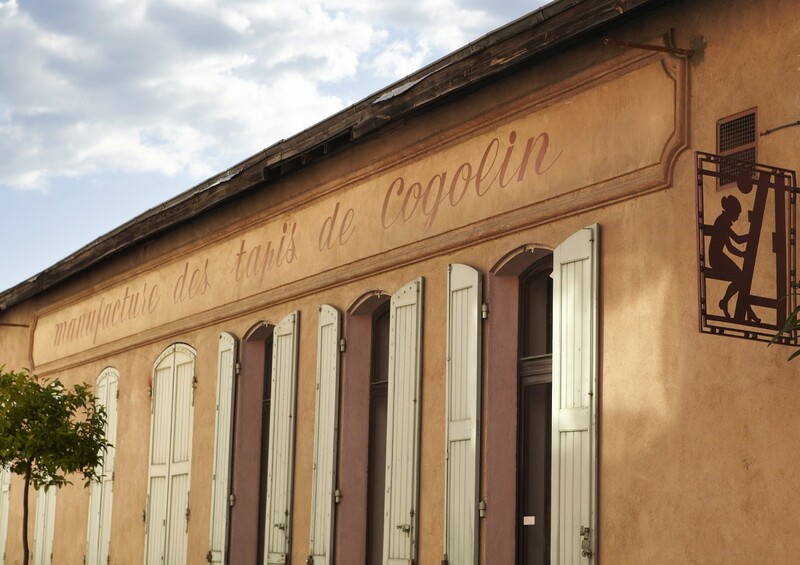 Cogolin uses only noble materials: wool, cotton, jute, linen, silk and raffia. A rich and luminous palette. 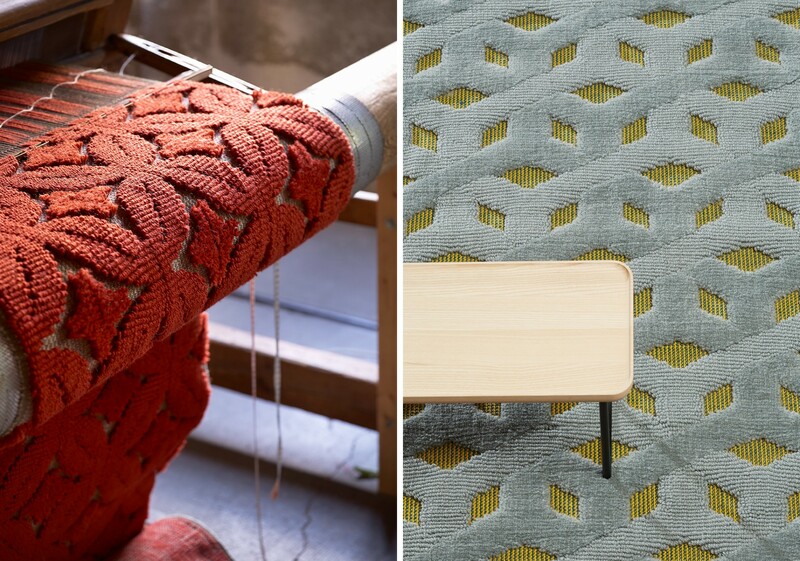 On the left Verne model on the Cogolin handloom and right Ponant model of “Cordelles et Épissures” collection. 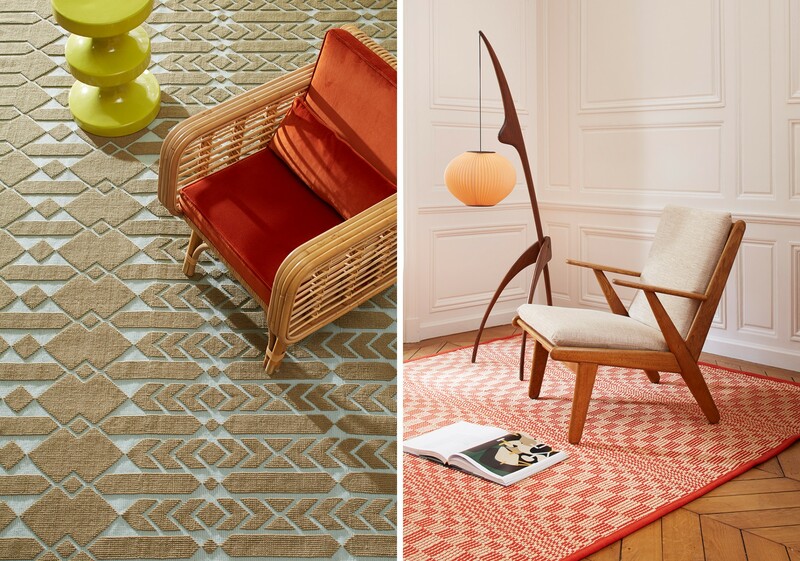 To the left cantre model “Jardin 16441” inside the collection “Jardin intérieur” by India Mahdavi and to the right a flat woven pattern “Ondulation” of “Ombres et Anamorphoses” collection. Panels range from 50 centimeters to 3 meters wide. 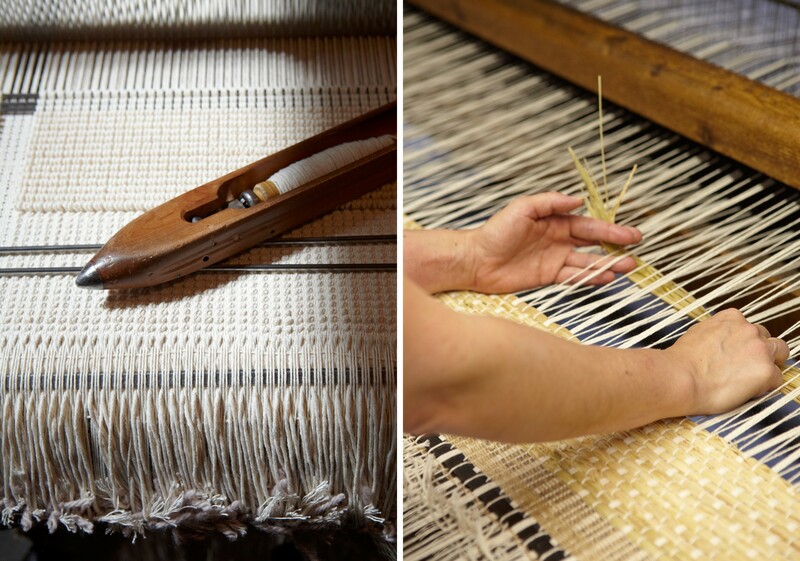 Warp in cotton, and weft usually in raffia, cotton, wool or linen.